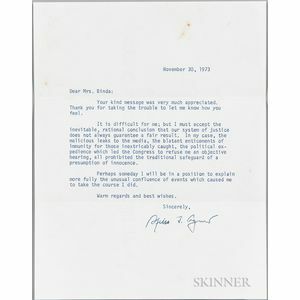 Agnew, Spiro (1918-1996) Typed Letter Signed, November 30, 1973. 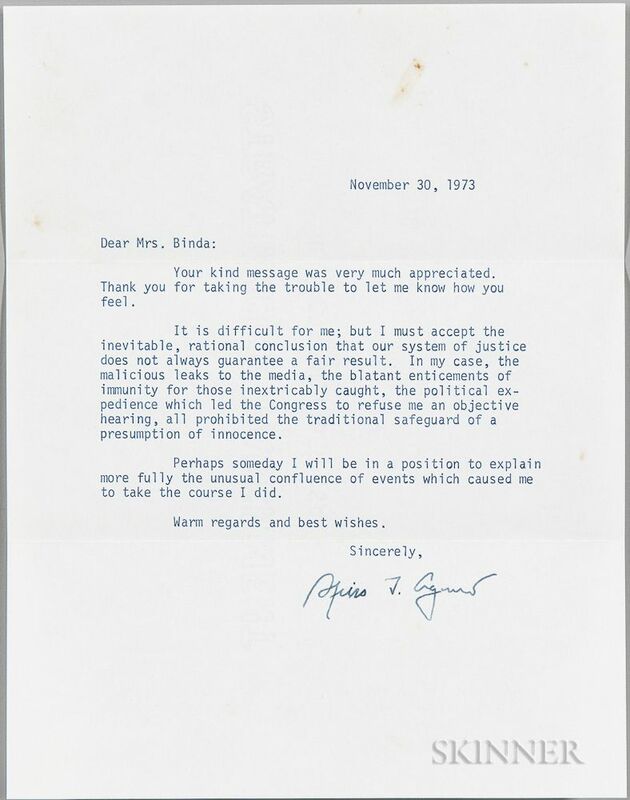 Single leaf of plain wove paper, typed over one page, with accompanying envelope marked Office of the Vice President, to a Mrs. Janet L. Binda of Orlando, Florida, regarding the circumstances of his resignation, 9 x 7 in. "It is difficult for me; but I must accept the inevitable, rational conclusion that our system of justice does not always guarantee a fair result. In my case, the malicious leaks to the media, the blatant enticements of immunity for those inextricably caught, the political expedience which led the Congress to refuse me an objective hearing, all prohibited the traditional safeguard of a presumption of innocence. Perhaps someday I will be in a position to explain more fully the unusual confluence of events which caused me to take the course I did."